Many products on the market now come with a limited lifetime or 50 year warranty. Some of those products may last longer than that in some conditions. Steel, Concrete and Composite materials are just a few of these products. Stone Coated Steel panels are quickly growing in popularity. Most steel panels carry a limited 50-year warranty, lasting twice as long as basic asphalt shingles. The steel panels are extremely durable, yet very lightweight, offering several different designs to choose from. Jayson Global recommends Metro Stone Coated Steel Panels (http://www.metroroofproducts.com/). Concrete Tile has been a proven roofing material for decades and has been known to last longer than almost all other roofing materials. Also extremely durable, Concrete Tile comes in several elegant designs giving homes an upscale, polished look. When the roof has finally lasted through its lifespan, the material can be recycled into road crush or used for other purposes. Jayson Global recommends Boral Concrete Roof Tiles (http://www.boralamerica.com/roofing/). While Enviroshake and other composite products are still relatively new in the roofing industry, it comes with a lifetime, non-pro-rated warranty and has been extensively tested to show a life-span of at least 70 to 80 years. Not only are Enviroshake products made of 95% recycled content, when the roof has finally lasted through its lifespan, the material can be fully recycled again. Enviroshake, Enviroshingle and Enviroslate are truly “green” products. Jayson Global recommends Enviroshake Composite Roof Shakes – looks like cedar but lasts three times as long. (http://www.enviroshake.com/). Request an estimate for any of these fine roofing products here. 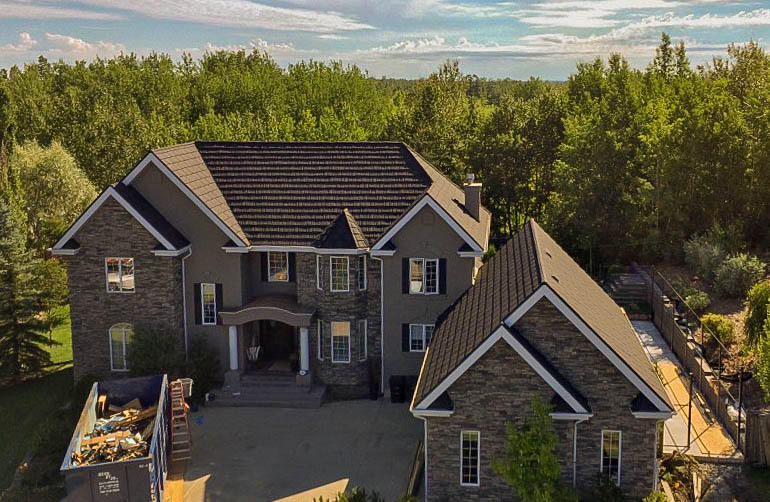 As one of the larger roofing companies in Edmonton, we can deal with all commercial roofing or exteriors projects through our commercial division. Our residential division will also be able to handle the roofing and siding requirements for your home. Our number for all your enquiries is 780.438.0331 or simply send us an email. We are fully ensured and carry full up-to-date Workers’ Compensation Board coverage (WCB) for all of our experienced roofing technicians. You will receive a full workmanship warranty on your roofing system, giving you complete peace of mind. Our testimonials page features reviews from just a few of our satisfied customers and we are featured on the Better Business Bureau with an A+ rating.